The three delegates including Professor Prasit Watanapa, Dean, Faculty of Medicine, Siriraj Hospital Mahidol University (Thailand), paid a courtesy visit to President Shinji Harada on December 11, 2017. Mahidol University is one of the prestigious universities in Thailand representing with historic Siriraj Hospital established in 1888. Since conclusion of university-level agreement with Kumamoto University in 2013, universities have been promoting mutual exchange of researchers and students. During the informal talk with President Harada, history of the exchange in the recent years have been reported, as well as the promotion plan for further exchange. The delegates also paid a visit to Professor Ando, Dean of Faculty of Life Sciences, and had a concrete discussion about Double Degree Program. Along with the courtesy call, given a chance to tour around the Kurokami campus and University Hospital and deepen the understanding of facilities of Kumamoto University. The event has been part of contribution for the promotion of further exchange. 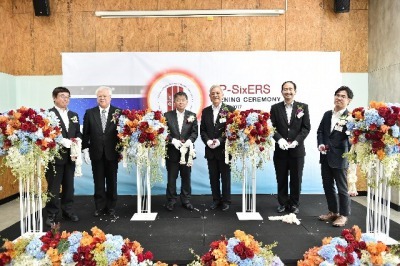 On August 21st, 2017, Kanazawa University and SUN/SixERS (Six National Universities International Education and Research System) hosted the Opening Ceremony for SixERS ASEAN Platform (AP-SixERS) in Bangkok, Thailand. The ceremony was attended by Mr. Shigeki Kobayashi, Head of the Cultural Public Relations Department at the Embassy of Japan in Thailand, Dr. Choltis Dhirathiti, Executive Director of ASEAN University Network, and approximately 100 participants from government agencies, partner institutions in Thailand, and Japanese businesses located in Bangkok, all of whom celebrated the opening of the new office. This office is the third joint office established by SUN/SixERS, a consortium of six national universities, Chiba University, Niigata University, Kanazawa University, Okayama University, Nagasaki University and Kumamoto University, after the Asian Platform (Changchun, China) was established in November 2014 and European Platform (Leiden, Netherland) was established in August 2016. The purpose of the joint offices is to promote exchanges with excellent universities around the globe, particularly with those in the regions of strategic importance. After the ceremony, there was a tour of the KX Building where the office is, after which the Memorial Party for the Opening Ceremony of AP-SixERS took place. 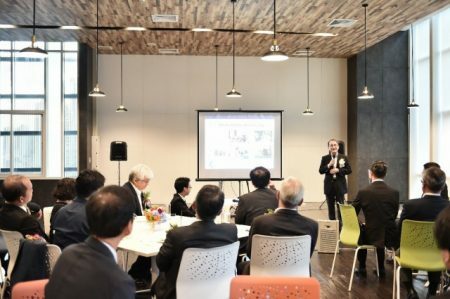 At the Party, the Vice-President for International Affairs at Kumamoto University, Prof. Kazuki Takashima, gave a short presentation to introduce Kumamoto University. 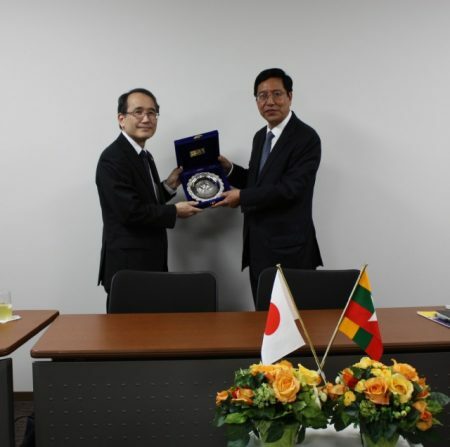 On May 15th, 2017, His Excellency, the Honorable Thurain Thant Zin, Ambassador Extraordinary and Plenipotentiary of the Republic of the Union of Myanmar to Japan, along with two other Myanmarian Embassy officials, paid a courtesy call on the Vice-President for International Affairs at Kumamoto University, Kazuki Takashima. Members of the Kyushu Myanmar Friendship Association were also in attendance, and in a friendly discussion we agreed to continue developing collaborative relationships. After that, a roundtable discussion was held, with about 10 international students from Myanmar who are currently studying at Kumamoto University, they discussed their student life at Kumamoto University and interest in Kumamoto. His Excellency, Ambassador Thurain Thant Zin and Vice-President for International Affairs Kazuki Takashima. 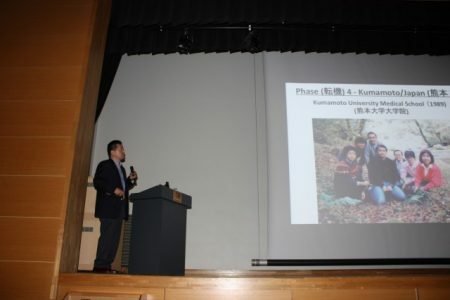 The KUMADAI Global Youth Campus Project, “Go Global Seminar” was held on January 27, 2017 at the 100th Anniversary Memorial Hall of Kumamoto University, under the theme, “What kind of people can play a leading role in the global community?” This project aims to provide students from local junior high schools, high schools, and technical colleges with an early global education. 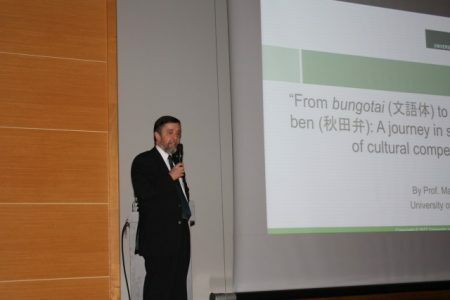 About 160 people, including students from high schools and universities, as well as people related to education in Kumamoto Prefecture, participated in the event and listened to lectures in English given by Prof. Marcelo J. Kuroda (Tulane University, New Orleans, USA) and Prof. Mark Williams (University of Leeds, UK), external board members of Kumamoto University’s globalization project. 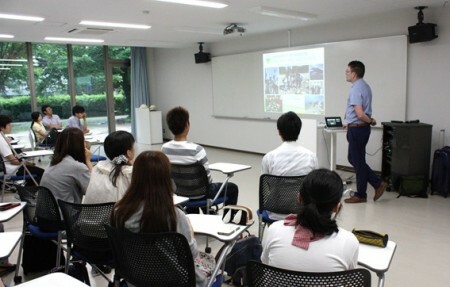 After the seminar, many high school students attended a brief session explaining the Global Leader Course, a new undergraduate course open in FY 2017. Kumamoto University Global Advisory Board Meeting AY 2016 was held on January 27, 2017 at Kumamoto University. 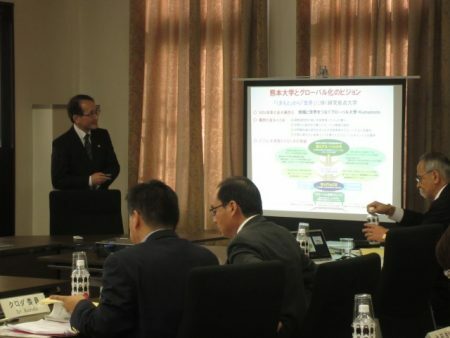 This meeting was held to consult with external experts who are well versed in the current university situation and operational approaches taken by universities in and outside Japan regarding development and implementation of our global strategies, promotion of international exchange for students and researchers, and implementation of our slogan, “A Leading University Cultivating Global Leaders from Kumamoto,”*1 as a university selected for the Top Global University Project*2 established by the Ministry of Education, Culture, Sports, Science and Technology of Japan. We will reflect their advice into our operational measures. 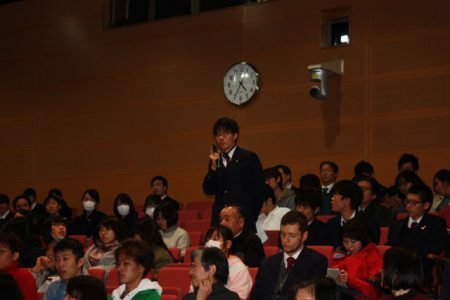 After an introduction from Vice President for International Affairs Kazuki Takashima regarding Kumamoto University’s efforts to promote globalization based on its concept, the participants, including President Shinji Harada, four Trustees, two related Vice Presidents, three Advisors to the President, and external members, discussed what has to be done to make Kumamoto University a more global institution. 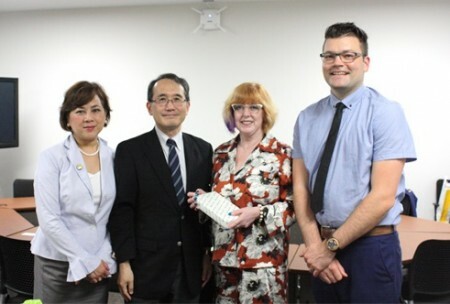 During the meeting, the external board members provided many valuable comments on the four policies*3 of Kumamoto University’s project concept, operational measures, and governance reform approaches, as well as advice on how to promote those projects from now on. After the Advisory Board meeting, “Go Global Seminar,” an event of Kumamoto University Global Youth Campus, was held, in which Prof. Mark Williams and Prof. Marcelo J. Kuroda gave lectures for Kumamoto University students and local high school students. 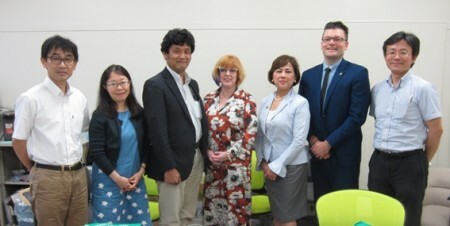 Incorporating the comments and advice from external board members into our future approaches, we will further promote globalization projects by leveraging strengths unique to Kumamoto University, an attractive university open to the world. *2. Founded in 2014, the Top Global University Project, a (maximum) ten-year project, aims to support universities that make efforts to globalize and strengthen international competitiveness. It works to establish a sound educational environment by carrying out university reforms and globalization measures. 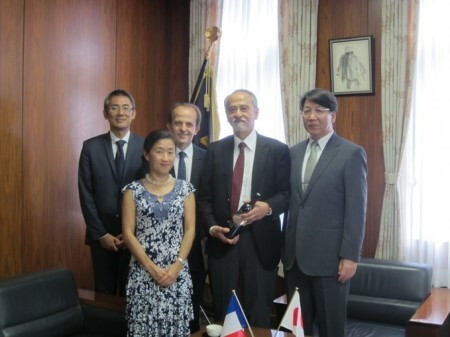 On September 16, 2016, Prof. Dr. Vincent Dousset, Vice President for International Relations, Dr. Reiko Oda, and Dr. Kentaro Mori of the University of Bordeaux paid a courtesy call on Kumamoto University President Shinji Harada and Professor Kazuki Takashima, Vice President for International Affairs. The University of Bordeaux is one of the top-level universities in education and research in France, and was established on January 1, 2014 by the merger of three universities: the University Bordeaux 1, the University Bordeaux Segalen, and the University Montesquieu Bordeaux IV. Since the establishment of a university-level exchange agreement with the Pole University of Bordeaux including the University of Bordeaux in 2007, we have maintained a close relationship through exchanging students and researchers. 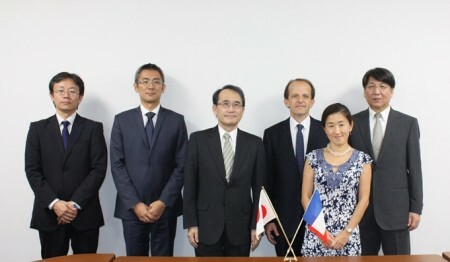 In March 2015, the Sciences and Technologies Department of the University of Bordeaux and the Graduate School of Science and Technology of Kumamoto University established an agreement for the double degree program. Additionally, a French-Japan joint laboratory for chiral nanostructures was established at Kumamoto University in October 2015. 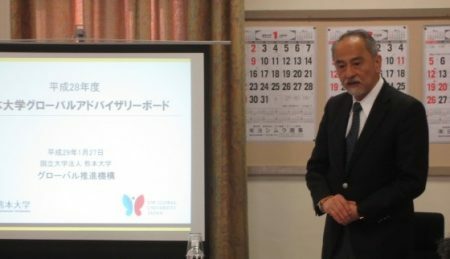 President Harada and Vice President Dousset shared their views on the possibility of future academic and student exchange and agreed to promote exchanges in the field of medical sciences, which is the special field of the Presidents of the two universities, as well as Vice President Dousset. During the meeting with Vice President Takashima, both sides introduced the university to each other and exchanged views about future collaboration in the field of natural science, and the courtesy call ended on a good note. This visit is expected to promote further exchanges between the two universities.